The sinuses are cavities, or air-filled pockets, near the nasal passage. 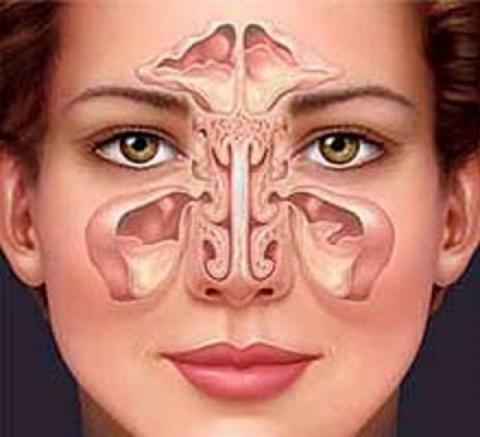 Like the nasal passage, the sinuses are lined with mucous membranes. There are four different types of sinuses: ethmoid, frontal, maxillary and sphenoid sinuses. Ethmoid: (between the eyes) located inside the face, around the area of the bridge of the nose. This sinus is present at birth, and continues to grow. Frontal: (in the forehead) located inside the face, in the area of the forehead. This sinus does not develop until around 7 years of age. Maxillary: (behind the cheekbones) located inside the face, around the area of the cheeks. 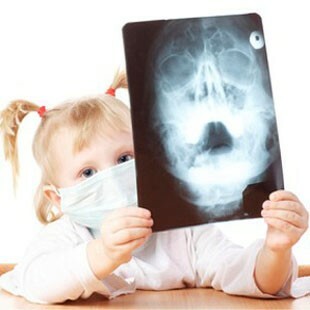 The maxillary sinuses are present at birth and expand rapidly by four years of age. Sphenoid: (behind the nose) located deep in the face, behind the nose. The sphenoid sinuses, which begin to develop during the first two years of life, are typically pneumatized by five years of age, and attain their permanent size by 12 years. Acute sinusitis is an illness that results from infection of one or more of the paranasal sinuses. A viral infection associated with the common cold is the most frequent etiology of acute sinusitis, more properly called viral rhinosinusitis. Approximately 6 to 13 percent of episodes of viral rhinosinusitis in children are complicated by acute bacterial sinusitis (ABS). Chronic sinusitis describes signs and symptoms of sinus lasting more than three months despite medical therapy. In recurrent acute sinusitis, sufficient change has occurred in the structure of the sinus system to predispose the patient to recurring bouts of sinusitis. Sinusitis is more than merely uncomfortable – it may exacerbate asthma or otitis media, and may cause complications like abscesses or sinus thrombosis. Sinusitis happens when one or more of your child's sinuses are inflamed or infected. 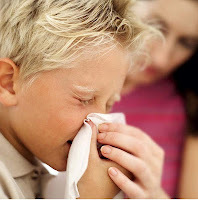 Sinusitis can be unpleasant for children. Possible symptoms include dental or ear pain, a tender face, a low fever and difficulty eating. Your child may also find it difficult to breathe through his or her nose. This can make your child irritable or tired. The most common cause of sinusitis is a cold or flu. Anything that blocks natural drainage openings in the sinuses can lead to infection, which ultimately leads to sinusitis. That means that allergies, ful, the common cold or a bacterial infection can cause siniusitis. Blockage may also happen when small projections called polyps are present in the sinus. Polyps can be caused by allergies or chronic infection. When the natural route of drainage is blocked, mucus builds up, many times leading to inflammation and infection of the trapped mucus.